I have spend many days in my life searching for sound effects. Two or three times a year I need a certain sound effect for a radio show, a theatre production of a friend, for a song that a neighbour band is recording or just for some project of my own . Usually I cannot find what i have in mind and use something else. Not so long ago a friend wanted a sound effect for a podcast, that would fit a change from one reality to another. I heard it immediately when I closed my eyes: this is what you hear in every science fiction movie. At least, that’s what I thought. But after going through all my favourite science fiction movies (and many more) I discovered that a) they all seem to have used the exact same sound effects, and b) that sound effect is a rather boring whoooiiish, that without the images doesn’t sound at all as if somebody’s reality is suddenly changed. I ended up making my own SFX, with our kitchen utensils. 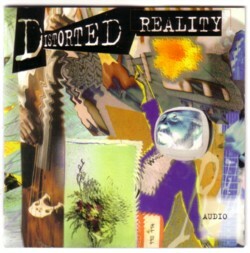 Last week I came home with a second hand CD called “Distorted reality”, on the Spectrasonics label. Somehow CD’s have little or no real value for me, so I hesitate to pay much money for a CD, unless there is some nice booklet with it, or unless it is stuff you can’t get on vinyl. While listening to the CD I read the text in the booklet. There was no name of the maker on the cover of the CD, but I read his name is Eric Persing, who was the Chief Sound Designer for Roland since 1984. (The CD is from 1995.) Ryeland Allison is also mentioned as responsible for this CD. If you want any more details, try this link. The CD is still available, but very expensive. Well, we cannot all be so lucky to find this stuff for one euro. May j have the names of all 99 tracks of Distorted reality please ?? ?